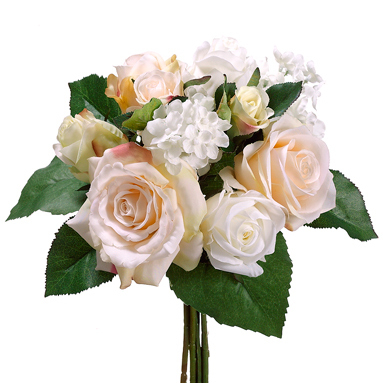 Stunningly beautiful, this 11.5" rose & hydrangea silk flower bouquet will prove that its just as realistic, breathtakingly gorgeous and romantic as the most expensive bridal bouquets you can buy. Why buy an expensive fresh bridal bouquet when it will be dead by the end of the day? A wedding is a special occasion with memories to cherish for a lifetime. So keep these memories alive with this stunning silk flower bouquet and cherish it for a lifetime!